In February, the Congressional Budget Office reported its estimates of the effects of raising the federal minimum wage. According to the CBO, raising the minimum wage to $10.10 per hour – as advocated by President Barack Obama – would cost the economy 500,000 jobs. However, it would also raise wages for those who keep their jobs, lifting 900,000 people out of poverty. A more modest increase to $9.00 per hour would reduce employment by 100,000 workers and lift 300,000 people out of poverty. The CBO report sparked controversy, with opponents of minimum wage increases highlighting the lost jobs and supporters focusing on the reductions in poverty. In determining how to weigh these factors, policy makers need to know something about both the short- and long-term social costs of the lost jobs. It turns out that these costs could be greater than previously thought because higher youth unemployment can have lasting consequences for young workers and previous empirical estimates may understate the effect of further minimum wage increases. Indeed, a new study by one of us suggests that most of the job losses from a minimum wage increase will occur among younger workers. Such job losses harm these workers’ ability to gain valuable experience at a critical time in their careers and permanently damage their future employment prospects. The research suggests that the Fair Minimum Wage Act, which increased the minimum wage from $5.15 to $7.25 between 2007 and 2009, resulted in a 2.8 percentage point increase in youth (under age 25) unemployment. During the great recession youth unemployment increased by 11.2 percentage points, so the increase in the minimum wage can account for about 25 percent of that increase. The harm done by minimum wage increases gets compounded for young workers because it prevents them from gaining experience, thus increasing their chances of being unemployed in the future. Taking this effect into account, the study finds that the minimum wage increases that occurred between 2007 and 2009 will ultimately generate a 0.8 percentage point increase in the overall unemployment rate for high school educated workers. In addition, past empirical estimates may be unreliable indicators of the effect of further increases. In particular, raising the minimum wage to $9.00 or $10.10 is likely to have a larger effect than previous increases. This is the case because wages have remained stagnant since the previous minimum wage increases during the great recession. Therefore, a large fraction of young workers earn wages close to the current minimum wage. Also, the proposed minimum wage changes are large, representing a 24 (for $9.00 per hour) or 39 (for $10.10 per hour) percent increase over the current level. Hence, these increases affect more young workers than prior increases. 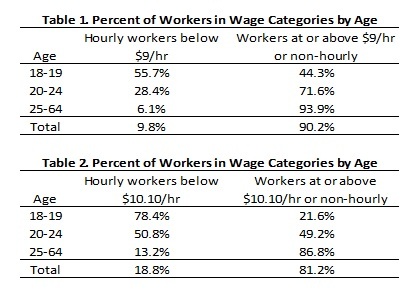 The second column in each of the two tables indicates the fraction of workers, by age, who are likely to be affected by the proposed minimum wage increases. This group consists of workers earning below the proposed minimum wage. They will either need to be paid more or lose their job as a result of the policy change. The third column in each table shows the fraction of workers in each age group who are less affected by the new minimum wages because they are either salaried or earn at least the proposed minimum wage. Table 2 shows that hiking the minimum wage to $10.10 affects more than three quarters of 18-19 year old workers and more than half of 20-24 year old workers. In contrast, less than 15 percent of workers aged 25 and older would be affected. Thus, job losses from the minimum wage increase are likely to be concentrated among younger workers. And the large number of workers affected increases the prospect of the policy doing serious harm. Much of the harm done to younger workers could be avoided by exempting individuals under the age of 25 from the minimum wage, as a number of other countries do. For example, the Netherlands has separate minimum wage levels for each age between 15 and 23, at which point workers are eligible for the full minimum wage. At least partially as a result of this policy, the Netherlands has experienced relatively low rates of youth unemployment compared to other OECD countries. The CBO appropriately acknowledged the uncertainty surrounding its employment estimates, stating that the drop in employment resulting from a $10.10 minimum wage could range from “very slight” to 1 million workers. The uncertainty surrounding the minimum wage’s effect on employment, as well as the strong possibility that further increases could be more damaging than those in the past, suggests that policymakers should be cautious about using the minimum wage as a policy to alleviate poverty.